The Eden Project in Cornwall is an unforgettable family experience in a truly spectacular setting. 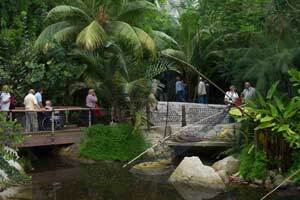 The Eden Project Near St Austell and Fowey is a great day out for the whole family. At The Eden project, you can explore the largest indoor rainforest in the world. The Eden Project is famous as the world's largest greenhouse. Inside the Giant artificial biomes are plants that are collected from all around the world. We recommend you set aside a good four to five hours for your visit and if you've been before, come again, as the experience is always changing. The following Hotel, Bed and Breakfast and Guest House accommodation is suitable for visiting Eden Project in Cornwall. This part of Cornwall is a great Familly Holiday destination close to The Eden Project, but also ideal for the beaches at Carlyon Bay. The Lost Gardens of Heligan and picturesquefishing village of Mevagissey are nearby as well as the beautiful coastal Port of Fowey. Bed & Breakfast Rescorla Farm House is nestled in the peace of the countryside and commands stunning views- With ample on site parking Rescorla Farm is ideally located within walking distance of the Eden Project and short drives to local wineries; Fowey; The Lost Gardens of Heligan; Lanhydrock House and gardens; Bodmin Jail Museum and steam railway; Wheal Martyn China Clay Heritage Centre; Screech Owl Sanctuary; The Camel Trail (bike hire available); The Pine Lodge Gardens and Charlestown Shipwreck Heritage Centre. Bed & Breakfast Piskey Cove is a friendly family business run by Gill and Alison Avery. All the rooms are en-suite, have a colour TV, along with tea and coffee making facilities. The back half of Piskey Cove is over 300 years old and the relatively modern front is 175 years old (we did say relatively modern). Bed & Breakfast + Glamping Glynn & Carolyn wish to welcome you to a comfortable farmhouse break or holiday. Largin Farm sits amidst the beautiful Cornish countryside & is within easy reach of the picturesque fishing ports of Looe & Polperro which are just a short drive away. Bed & Breakfast A spacious family home, built in the early 1930s, in the heart of St Austell, set in a large secluded garden. Breakfast is served in the light and airy dining room, where you can enjoy a full English breakfast. Located a couple of hundred yards away from the coach and railway station.